There are a lot of different types of curry out there, but I tend to stick to the Indian or Pakistani varieties, with maybe the odd Thai green curry every now and again. To me, the Indian sub-continent is the spiritual home of the curry, but that doesn’t mean that other regions don’t make astonishingly good curries. This is one of them. It’s from Myanmar, as Burma is now known, which sits on the Bay of Bengal, wedged between India to the west and Thailand to the east. The distinctive food cultures of it’s neighbours is reflected strongly in a lot of Burma’s cuisine, and this curry is a great example of exactly how – Indian spices mix easily with the more southeast Asian flavours of lemongrass and fish sauce. Start by marinading some skinned chicken, chopped up into small, bit sized pieces in two teaspoons of hot curry powder, half a teaspoon of garam masala and one and a quarter teaspoons of salt. Work the spices into the chicken well, cover and refrigerate for an hour or so to let the flavours penetrate into the meat. Meanwhile, blend an inch of peeled ginger, three cloves of garlic and two medium onions in a blender with a splash of water until you’ve got a smooth paste. Add half a teaspoon of cayenne pepper and two teaspoons of bright red paprika to the blender and mix them in. Heat a large pan on a medium heat with a good glug of oil in it – corn or groundnut oil would be best – and then pour in the onion mix. Stir and fry for six or seven minutes, then add the marinated chicken and cook for another three or four minutes, turning the contents of the pan regularly. Add two peeled and chopped tomatoes, a tablespoon of fish sauce, or nam pla, and a stick of lemongrass. Gently bash the bulbous part of t lemongrass before using it, and tear away the tough outer leaves first. Stir the chicken for yet another two minutes, then add 250ml of water and put a lid on the pan, letting it all bubble away gently for twenty-five minutes. Take the lid off for the last few minutes and turn the heat up, to let the sauce reduce and thicken a little. The finished curry is fascinating. The tastes of India and Thailand work well together, better than you’d expect. The zingy citrus flavours of the lemongrass and the earthy salt of the fish sauce marry well with the delicate complexity of the garam masala and the, quite frankly, fearsome heat of the cayenne. It should be a hopeless jumble of flavours, but i isn’t. Instead, it’s a cohesive and interesting dish, a real taste of two cultures. These flavors are just about some of my favorite in the world. Thanks!! This looks great! 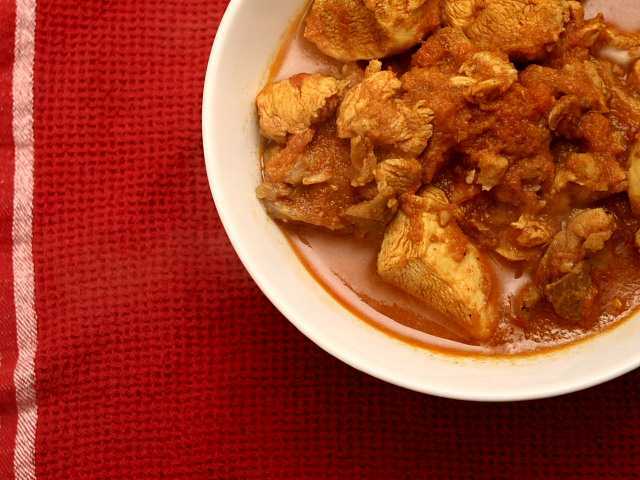 I've loved curry chicken since I was a child and now my own kiddos love it, too. Can't wait to give this one a try. Thanks for sharing. I love the history that you gave and the description of the flavors. I need to remember to make curry. We enjoy it but don't think of making it often. Thank you for the inspiration! This recipe sounds delicious! I love that area of the world, my favourite currys I have ever tasted have to have come from Indonesia….. never cooked with groundnut oil but will be sure to give it a go!! I love curries and I'm always looking for new recipes to try. I'll definitely give this one a try soon. Anything with garlic and ginger has to be good! This sounds like a fantastic recipe. Thanks for passing it along as well as the lesson on curry. I am crazy about curries, and this one is new to me; it looks and sounds absolutely delicious, though. I'm going to have to put this in the rotation! nice flavors u writed about, good job! i love curry, would love to try that.. tx for sharing..